Take My Poll Up Top and Let Me Know What You Think - Am I Paranoid????? 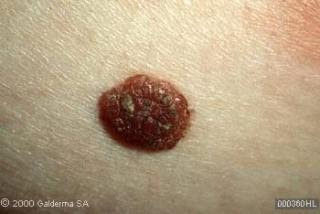 The mole on my leg - looks a little like this one.. I know the A B C D E of moles - BUT... I'd rather have a doctor tell me..
Asymmetry can be assessed by comparing one half of the growth to the other half to determine if the halves are equal in size. Unequal or asymmetric moles are suspicious. 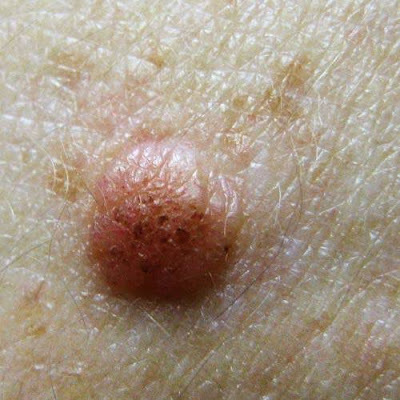 If the mole's border is irregular, notched, scalloped, or indistinct, it is more likely to be cancerous and is suspicious. 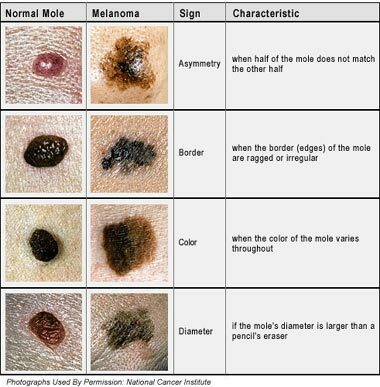 Variation of color (e.g., more than one color or shade) within a mole is a suspicious finding. Different shades of browns, blues, reds, whites, and blacks are all concerning. Any mole that has a diameter larger than a pencil eraser in size (> 6 mm) should be considered suspicious. If a mole is elevated, or raised from of the skin, it should be considered suspicious. Better to err on the side of caution. I don't think you're being paranoid at all, especially with a family history. Good luck! I hope they're nothing! Those photos look normal to me!! Infact they look like some of the moles I have about my person. It's always best to get checked and so I think you are doing the right thing. Do hurry back and let us know how you got on. I don't think you're paranoid. Better safe than sorry! I think it is always good to have them checked. My husbands family has "mole genes" I swear. So all of my kids have large and weird looking moles. I have had them into the dermatologist pretty regularly growing up and while all the moles have been fine I have still had some of the larger ones removed because they are just ugly and I was also afraid they would eventually turn into something. Not paranoid at all! It's important to have these things checked out! Glad it wasn't that bad! I have to go see the dermatologist every year so that he can do an all body check since I have had several basil cell melanomias removed. You said he burned your moles off, mine cuts them off. Takes several weeks for them to heal especially if they are big. I agree with most of the comments here - check it out while you have the chance to do that. Some folks do not have insurance and have no choice - I feel blessed at 71, knowing I have coverages that allow me to have things checked. Yes, the doctor burned it off with that cold/hot liquid stuff.. Also burned off a pre-cancer on my back... 50/50 chance the burning did the job on the basil, I go back in 3 weeks - if not gone - they will cut it out..yuck.. I have some moles I need to get checked out. Glad your appt. was OK! What ended up happening? Was the burning good, or did you end up having to have it excised? I have to go every 6 months b/c my aunt had a melanoma and I had a pre-melanoma taken off. My mom just had a squamous-cell taken off. If you're gonna get skin cancer(as if any of us do it on purpose), basal cell is the way to go! Those are less likely to spread. Hope everything is fine now. I try to tell everybody to go get checked at least once to get a base-line scan. I'm enjoying your blog very much! I've got a similar paranoia. A few days ago discovered a raised mole 8 by 4 milimiters in size. It's mostly greish-brownish in color but it's got some black spots within it. I rushed to the dermatologist and all she did was to glance at it for 5 seconds and say it's alright. I asked for a biopsy and she refused! WTF?? ?